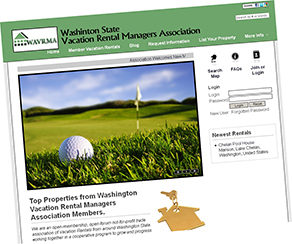 Our Association (www.WAVRMA.org) offers a free state wide directory of rentals exclusively from its membership at WAVRMA.com. Visitors to Washington State have a new and better way to find Vacation Rentals in every corner of the state. Listings are only homes from qualified professional managers. Guests can be assured of clean, well furnished homes and quality guest services. Renting from a manager eliminates the risk of absentee owners, inattentive staff and ruined vacations. There are an unlimited number of photos, the site uses Google videos and includes complete description of bedrooms, amenities and other features. Available dates and rates can be shown. Many homes and managers have been certified by the Vacation Rental Association (VRIA.org) a national not-for-profit trade association. And listings are automated through the the Vacation Rental Multiple Listing Service (www.VRMLS.org) the first of its kind and provided by VRIA. Through the website guests can easily contact manager directly by form, email or telephone reducing the back and forth or on-hold time incurred in renting from owners directly. With the new website, visitors no longer have to take a chance wondering if the person they are renting from offers full service professional assistance or is a hobby owner living hundreds or thousands of miles away. Guest use of the WAVRMA.com website is free and available now. Visit WAVRMA.com today. The Vacation Rental Multiple Listing services(VRIA.org) is owned by the Vacation Rental Association (VRIA.org) and is the first open-submission, open-distribution method where owners and managers can list their property once and then choose from hundreds of websites on which to advertise with a single click. Use of the service is free and many of the website listings are free, or at nominal cost. All VRIA members can use the service.